How can non-members place a store order? In a standard configuration, the web store is only available to members who hold a subscription. With Guest Store Access, you can open your web store up to anyone. This allows you to tap into the commitment-phobe market and can also be a great way to promote certain seasonal or one-time purchases. Are my current system settings compatible with Guest Access? 1) Store Checkout Setting: The Guest Access feature is compatible with the store checkout setting of "At Checkout" or "On Delivery". This is to ensure that everyone, both members and non-members, enter payment information for their order at the point of purchase. 2) Order Minimum value: If you have a store order minimum, this minimum will apply to both subscription members and Guest Access members. Email us at support@farmigo.com if you have any questions about these settings and if you would like to enable the Guest Access feature. 1) Confirm that your system settings are compatible with the Guest Access feature. 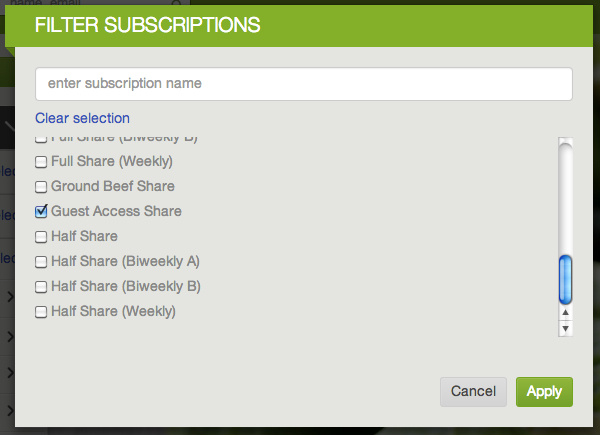 - Name it something like "Guest Access"
- Assign the share to a schedule. We recommend that you assign it to the schedule that gives members the most opportunity to order (i.e. if you deliver on a weekly basis, assign Guest Access to your weekly schedule to allow guests the opportunity to order each week). Alternatively, you can create a unique schedule for your Guest Access share. 3) ﻿Email us at support@farmigo.com to let us know that you would like to enable this feature and confirm the name of the share you created for this purpose with the support team. We will assign the subscription to the Guest Access feature. Now, non-members will be able to complete an abbreviated sign-up via your Store link, and will automatically be assigned to your Guest Access share. How do I manage Guest Purchases? Guest orders will appear in your Store Orders filter, and will also appear on all regular order reports. To see a list of all guests, filter for the "Guest Store Access" subscription in the Member page.